UPDATE: In 2018, Fearless Girl was moved away from the Charging Bull and placed directly in front of the New York Stock Exchange. Millions of tourists line up to take photos by the giant bronze bull at the foot of Broadway in Downtown Manhattan. Its bronze horns and testes reflect the shine of millions of hand rubs since 1989. But how many of those visitors know the actual history of the famous sculpture? Or the story behind the much shorter addition standing opposite the Charging Bull? Artist Arturo Di Modica came to New York City in 1973 and garnered immediate attention for his sculptures. He already had a following in his home country of Italy, first in his small Sicilian hometown of Vittoria, and then in Florence, where he studied and opened a studio. After finding success in SoHo, Di Modica built a new studio on Crosby Street, and it was there that he cast his famous Charging Bull sculpture. Di Modica had come to admire the industrious sprit of his adopted city, and by the people who arrived daily, filled with optimism and often, little else. In 1987, the stock market crashed on a day that became known as Black Monday (the Dow Jones index dropped 23% in a single day of trading). It ultimately bounced back (and actually ended 1987 up 2.26% for the year), and Di Modica wanted to do something to honor that resilience. The finished product of his tribute was the Charging Bull. It took him two years to complete and then, in the early morning hours of December 15, 1989, Di Modica and some friends loaded the giant bronze bull onto a flat-bed truck and transported the sculpture to the New York Stock Exchange. They deposited it in the middle of the night under a Christmas tree that had been set up outside the Exchange. When daylight broke, spectators and news media from around the world gawked at this unexpected gift, which weighed in at three and a half tons and stretched 18 feet in length. The executives at the New York Stock Exchange were not pleased, and spent a full day figuring out how to move the enormous “guerilla” work of art. By the time they loaded it onto a flatbed truck, the oversized bull had gained so much attention that people everywhere protested its removal, causing city officials to step in. Charging Bull was relocated to its permanent home in front of Bowling Green (New York City’s first public park), just south of Wall Street. 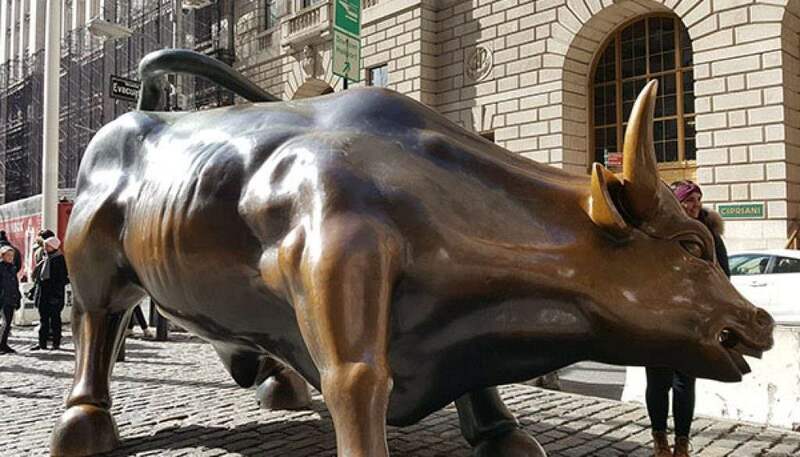 The artist gifted the sculpture to show his appreciation for the spirit of New York; he saw it as “the perfect antidote to the Wall Street crash…” Ironically, though, the bull has gradually come to signify the power of Wall Street itself rather than a counter-symbol. For that reason, the bull was blocked off to the public for the first time in its history during the early days of the Occupy Wall Street Movement back in 2011 (in the aftermath of the “Global Financial Crisis”). City officials feared that frustrations would be taken out on the bull, and wanted to protect what had become a city landmark. If you’ve seen it, then you know: it’s one of the most visited sites, as well as one of the most photographed public sculptures in New York City. But after nearly 30 years of being the center of attention, Charging Bull got company. It was another bronze statue (albeit, of much smaller stature) and another act of guerilla art, dropped off opposite the bull on March 7, 2017—the eve of International Women’s Day. Standing only 50 inches high and weighing 250 pounds, Fearless Girl was no match in size for Di Modica’s bull, but that seemed to be the point. She stood, hands on hips, chest confidently pushed out, facing the bull, unafraid of the obstacle in front of her. 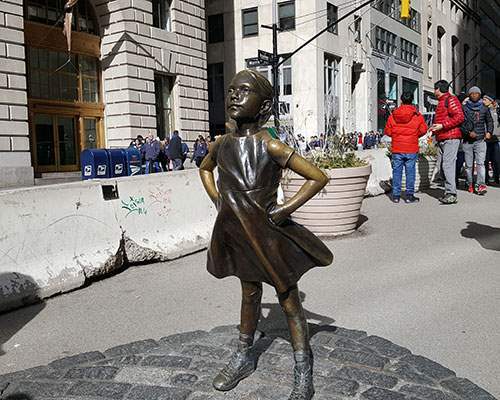 Fearless Girl appeared shortly after the first Women’s March that rippled around the country and the world. The mood was right for a brave female to symbolically stand strong in front of a masculine icon. #FearlessGirl trended on social media and even more tourists flocked to Bowling Green with their Nikons and Canons. But despite its immediate popularity, not everyone was thrilled with this newest installation. 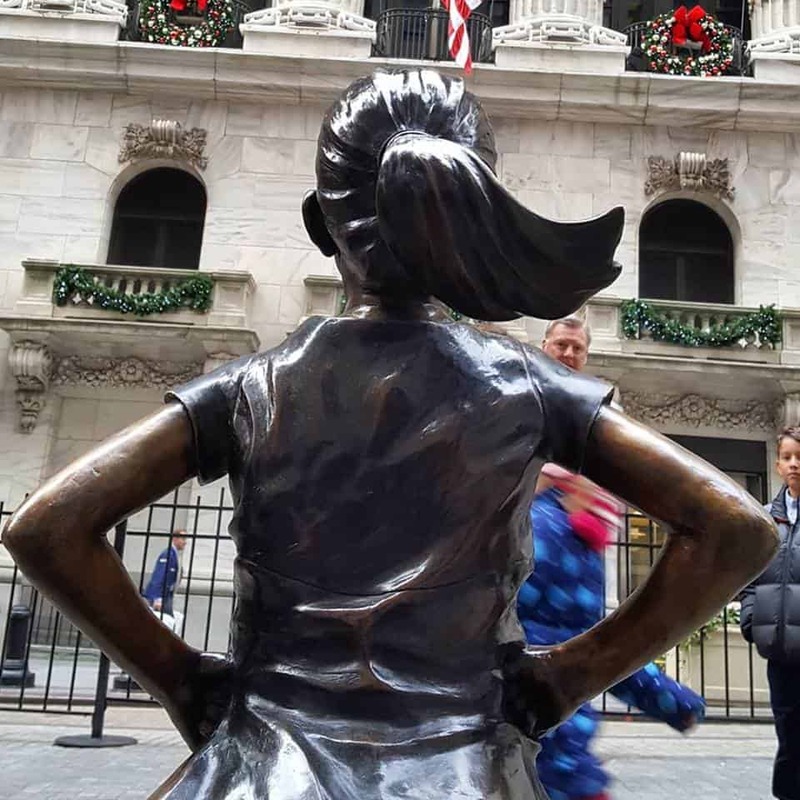 Fearless Girl, created by artist Kristen Visbal, was commissioned by the mammoth asset management firm, State Street Global Advisors. One of their goals was to push financial firms into bringing more women on as board of director members; its second purpose was essentially an ad campaign for a gender-diversity index fund (an “ETF” traded under the appropriately-chosen ticker, SHE). In was all-the-more ironic that the same financial firm that commissioned Fearless Girl ended up settling a gender-discrimination court case for $5 million. Last year, the case was brought to court by female State Street executives who accused the firm of underpaying them vis-à-vis their male counterparts. The person most upset about the addition of Fearless Girl was, of course, Arturo Di Modica, who disapproved of the commercial nature of the sculpture. In a press conference, he said that his beloved bull, which symbolized “freedom, world peace, strength, power and love,” had now become an object of negativity. He called for Fearless Girl’s immediate removal, but Mayor De Blasio, by popular demand, approved for her to stay put for at least a year.